city of royal Rajasthan is legendary. This festival coincides with Holi, which adds more charm to it. Fortunately I got the chance to be a part of this wonderful and colorful celebration. Tourists from far and wide gather at the Chaugan ground in Jaipur to treat their senses to amazing sights of the festival. 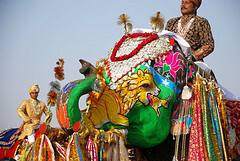 Elephants are the main attractions of the festival giving a royal feel to the celebration. Adorned from head to toe, the elephants are beautifully painted and dressed. Elephant race and beauty pageant are the major highlights offering a great deal of fun to spectators. Mounted on elephants people play holi. How interesting! Music and dance performances are also a part of this festival. A unique concept, the kite festival is held on 14th January with great enthusiasm. Dedicated to kite flying, the festival is the time to adorn the sky with colorful kites. The competition is really tough. While striving to take the kites to great heights, the participants also enjoy feasting on delectable delicacies. 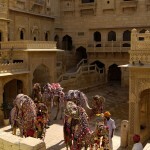 Reflecting the rich cultural heritage of Rajasthan, this festival is celebrated for more than a week. Wonderful cultural and folk programmes, art exhibitions, performances by international artists and gathering of the literary geniuses are the main attractions of the festival. You can attend any of the events in the festival for free! Holding great importance, especially for the womenfolk of Rajasthan, this festival is celebrated for around 10 days. Women worship lord Shiva and his consort goddess Parvati during the festival. Prayers are offered by women for a happy married life. They also take out processions in the streets during the festival.